Tips for writing engaging stories about animals your organization has helped. Whatever point you wish to make, start with a real individual animal. This will catch and hold your reader’s attention. The kind of animal it is: A fledgling white-winged dove, a young community dog, a working horse. For wildlife, give the correct species name. When: Date, year, season, time of day. Including the weather as well helps bring the story to life. Where: Country, what region of the country, town or village, nearest large city, area of the city, characterize the area. Example: A hill in the forest leading up to Name of Town — or a rundown area on the south side of Name of City — or a wealthy seaside resort on Name of Beach. Include names of rivers, forests, streets. Why and what: What were the circumstances in which the animal needed help. Touch lightly on the problems (no graphic or disturbing details). Include incidental descriptions to add color to the story. Describe people, places, the weather, actions, what the animal was doing, what people said, did. How the action unfolded and how the animal was rescued or treated. Be specific. How: In what way did you help the animal? Who: Name the individuals who helped the animal. Names of people, like names of places, add specificity to the story; they make it more real, more tangible and more readable. If confidentiality is required, you may wish to use only first names. Outcome: The story needs a happy, uplifting outcome. If there is an unhappy ending, write a different story instead. The point of the story is to leave the reader feeling inspired, uplifted, and encouraged by the story and by the work your organization is doing. How can people find your website or Facebook page? Summary: You don’t need every bit of the information listed above: just make good use of the information you have and do your best to get good information. It is essential that every detail be true and accurate. If you make up or exaggerate details, your story will have a different flavor, and people will not believe it. Remember to include descriptive details that set the scene and make the story and the people and animals real to your reader. Use the example of one happy story of one animal to convey the point you wish to make. Do not succumb to the temptation of including gruesome, unpleasant details in the final paragraph. Keep the tone hopeful, positive, upbeat, and uplifting – otherwise you’ll have undone all your good positive writing in the rest of the story. The more encouraging and upbeat you are (while remaining true to the facts, of course), the more responsive and helpful your readers and supporters will be. Positivity engages people and achieves results. Even in disaster rescue, you can be realistic without being distressing. You can be straightforward and clear, without being disturbing. Avoid upsetting details – find a gentle way to convey the terrible aspects of the story, and leave your reader feeling confident in your good work. Focus on the animal you’ve saved and on the excellent work you are doing. Mention grim facts in a brief, gentle way at the beginning, not the end. You must end on an up note! 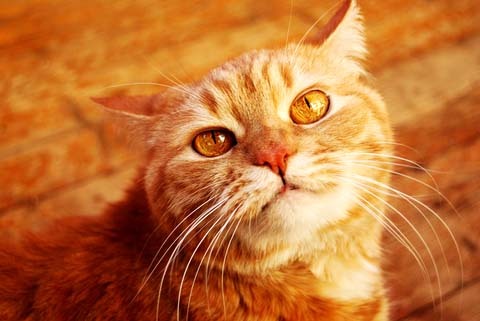 Photo: © Evgenya Schcipanskaya / Dreamstime.com / Orange cat.